Welcome back, intrepid space friends! It’s been almost a year (9 months, shoot me, mkay?) since I wrote the first instalment of Beyond the Overview. In that article I showed the ins and outs of the EVE Online client, with the aim of maximising usability and real estate. This time, I am going to look at some of the shortcuts that I use for fleet PvP, and a few of the nifty settings which I feel make it easier to be effective when leading or participating in a fleet. Just like last time, I want to stress that EVE settings are very personal; these are just suggestions to get you started. I am going to assume that you haven’t changed too many of your settings and shortcuts from the defaults; if you have, you might consider resetting them to start with. The first, best improvement for PvP is to turn off “Move entries with broadcasts to top” of the overview. There is little point ordering your overview in any meaningful way, if you have a setting which changes that order. Given that you also have another entire window dedicated to showing the most recent broadcasts, this setting adds nothing, and risks turning your overview into a confusing mess. Next, I am going to tackle the broadcast window settings. These are reasonably straightforward, but to quickly recap, you can broadcast specific messages to your fleet members. The broadcast window can also filter the messages you see. This next image shows how I set up the colour-coding of my broadcasts. To bring up the broadcast settings, while in a fleet, click the tiny menu button in the upper left-hand corner of the fleet window. To change the colours of the broadcasts, click the drop-down arrow to the right of the broadcast you want to change. The colours I have selected feel the most intuitive to me, according to what the broadcast is for. 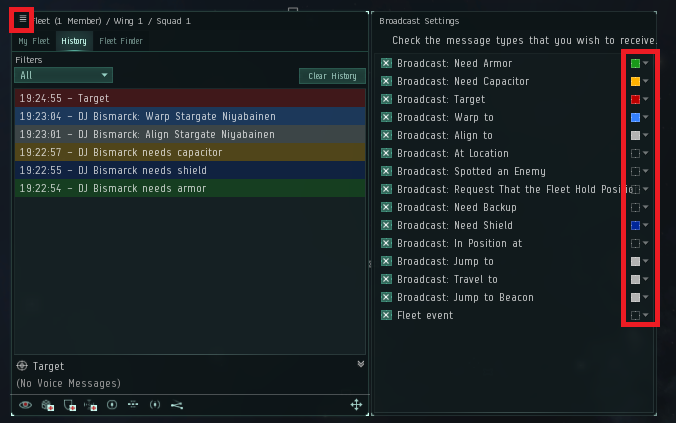 You can also filter out some types of broadcasts completely; for example, in a mixed shield and armour fleet, if you only have remote shield repairers, you may choose to filter out the Need Armour broadcast – just make sure you turn it back on if you’re in an armour fleet another time. On the left of the broadcast window you can also filter broadcasts by type; I generally have mine set to “Broadcasts”, although it is sometimes interesting to look at loot history at the end of your fleet. Under the main EVE menu (push Escape to open, then select Shortcuts > Navigation), you have the fleet broadcast settings. You can map keys or key combinations to the various Fleet Broadcasts. There are only four really time-critical broadcasts for fleet PvP – but first we need to free up some keys. Following on from this, I find that in the heat of glorious internet spaceship battle, overheating your modules should be only a few key-presses away. Overheating guns is usually not as time-critical as, say, overheating your hardeners. Therefore, as shown in the next image, I have changed Toggle Overload on low-power slots 1-4 to Shift + <Q/W/E/R>, and medium-power slots to Shift + <A/S/D/F/>. You may have to clear some other shortcuts to make these keys available for these functions. As you can see in this menu, you can set a shortcut for almost every action in the game. Even though the list of these can be quite extensive, think about what you spend most of your time doing while PvPing. When I chose these shortcuts, 25% of my time would be clicking in space controlling position and transversal; 25% spent broadcasting targets, 40% maintaining situational awareness of the battle space, and the last 10% would be clicking modules and overloading things. Most of my shortcuts involve either the CTRL or SHIFT keys, and the left-hand third of the keyboard. These are all just suggestions, but I have two general recommendations for using shortcuts. First: keep it simple and accessible. 95% of your time in EVE is spent with one hand on the mouse, so it’s fairly pointless to set a shortcut as Windows Key + F12 if you want to use it in combat. Second: practice using your shortcuts, and train your muscle memory; using them should be second nature. I will try not to leave it for almost a year before posting the next part of this series; leave a comment if there is something you would like help with, and I’ll do my best. Have fun, and practice hard. See you in space!